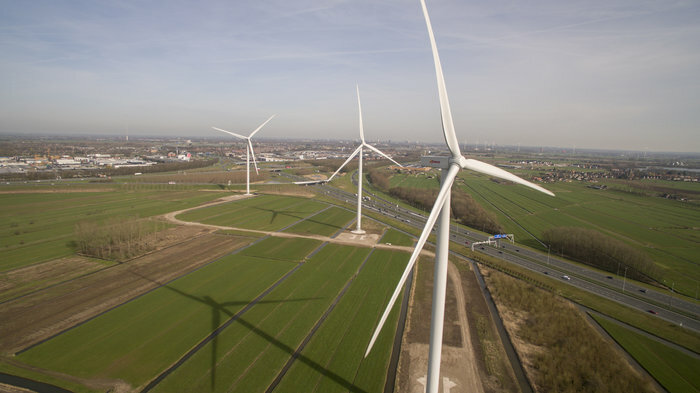 Royal Schiphol Group, Eneco and the municipality of Vianen has formally opened the new Autena wind farm in the Netherlands. The farm consists of three wind turbines, two of which will supply green energy to Royal Schiphol Group. The supply provides approximately 20GWh per year, which is comparable to the annual energy consumption of 17,000 households. Eneco is set to build more wind turbines for Royal Schiphol Group over the next two years, meaning that by January 2020, all of the power for the airport company will come from newly constructed Dutch wind farms. The long-term contract with Royal Schiphol Group enables Eneco to invest in new wind farms, meaning Schiphol will not be drawing power from the existing sustainable energy network. It will also increase the total supply of sustainable power in the Netherlands. The names of the wind turbines were decided by primary school pupils from Vianen, who submitted suggestions for the names. The winning entries were ‘Flying Electric’ from Egbertus primary school and ‘GreenTower’ from OBS Tijl Uilenspiegel.